What to do BEFORE you lose your Android phone! A few weeks ago, nearly 2 weeks ago to be exact, my mother-in-law lost her phone. Luck having it she didn't share until the night before the hubby and I were to leave for a quick road trip. Thankfully I still had my trusty Galaxy S4 and I was able to switch her number over in the wee hours before we left. Now my mind was racing to think how to avoid this situation in the future. Well, in the past I had used Where's My Droid and thought, why not go back to the old faithful! Once we received her replacement phone, I installed it from the Google Play store immediately. It was a very easy install and didn't take more than a couple of minutes. In addition to the base install I enabled the passcode feature so that no one would be able to modify the app settings without the code. 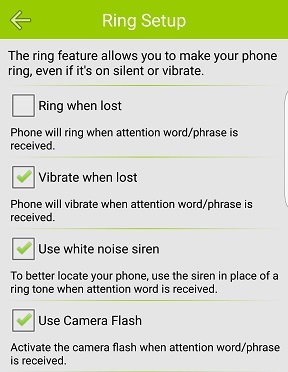 Ring Set Up - This allows you to indicate how the phone will ring when remotely activated. I personally prefer vibrate and the white noise siren over a normal ring. GPS Setup - THE MOST IMPORTANT FEATURE!!! Allows you to enable GPS to locate your phone. You can even set an alert for the app to email you when your battery gets to a certain level. Passcode - Allows you to set a custom passcode to keep unauthorized people from changing the settings. Thank goodness I did because lightening struck twice and her phone went AWOL again. I logged into the web-based Commander from my computer and selected to find her phone. I selected the Accurate Location option and in about 5 or 6 minutes it provided me with a location with the latitude and longitude and a visual with Google Maps. I was able to zoom in and see a near by business and select that address. Next, I went to Google maps and put in that nearby address. I was able to scroll and zoom to get the actual address provided by the Commander. She recognized the address and is going to check first thing this morning to see if her phone is still there. Check me out on Twitter to find out if she was able to retrieve her phone!